Before you start the Whole 30, or do your own version of clean eating, make sure you get ready by buying lots of good meats and veggies and get ready to cook. It will save you time during the week, but also, you will be much more likely to stick to the plan if you have things to eat at your finger tips. By the way, this is not about restricting how much you eat. It’s about eating things you like, and just excluding the no-nos. So eat until your heart’s content, and eat well! So after many of my initial posts of sharing what my kids eat, I’ve had people ask me what I eat (for breakfast and lunch) so I thought I would share. I want to eat things I really enjoy and honestly I just can’t eat raw veggies all day long, nor do I want to. So, Sunday night as I cook my kids lunch for the week, I am also preparing my own meals (lunches and snacks). Breakfast: I will always have my salad. I use Trader Joe’s no horomone chicken cooked out of it’s casing. Then, in a large bowl I’ll add organic spinach (I get the large rectangle packs at Costco or Whole Foods) and flax oil, apple cider vinegar (or lemon juice), and roasted flax seeds (Trader Joe’s). I know, it sounds weird to have a salad, and you’re probably thinking, “I could never have a salad for breakfast”. I use to think the exact same thing, but I’ve come to look forward to it and really, it digests super fast so if you’re going to exercise in the morning, there’s no having to wait 2 hours or deal with any cramping. But on top of that, I just love starting the day with something as nutrient dense as spinach. Sometimes if I’m really hungry, I’ll also have a bowl of soup or whatever is already made in the fridge. 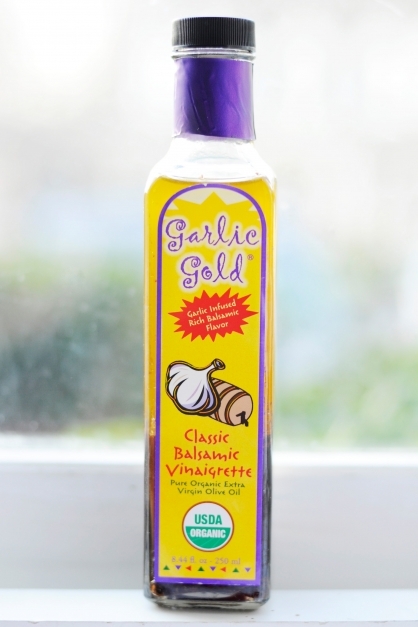 I am not one to use store-bought salad dressings, as I always like to make but own, but I do love Garlic Gold. It also is great on your roasted brussel sprouts. It’s all natural and they only organic olive oil, balsamic vinegar and spices. They also have a lemon and red wine vinaigrette. I get it from Vitacost.com or from them directly. Most mornings, I’ll also make the roasted okra first thing in the am since it takes 45 min to cook, but only about 4 minutes to prep. It’s a great addition to breakfast or nice to have a snack already made for later. I buy it pre-cut, put the frozen okra in a big bowl and microwave it for 3 minutes. Then, spread it over parchment paper so it lays flat, spray it with coconut oil, add celtic salt, and let cook on 450 for approximately 45 minutes (turning every once in a while) until brown. Lunch example: This is one I’ll have often but I love my bowl of butternut squash soup with either turkey burgers, some steamed broccoli, mushrooms, crushed Brazil nuts or slivered raw almond, or sausage. 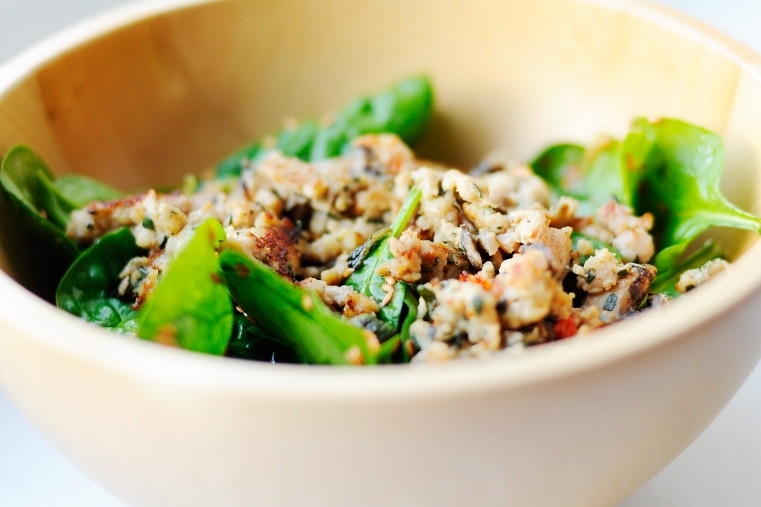 I really like the heartiness of adding some extra protein, veggies or nuts. 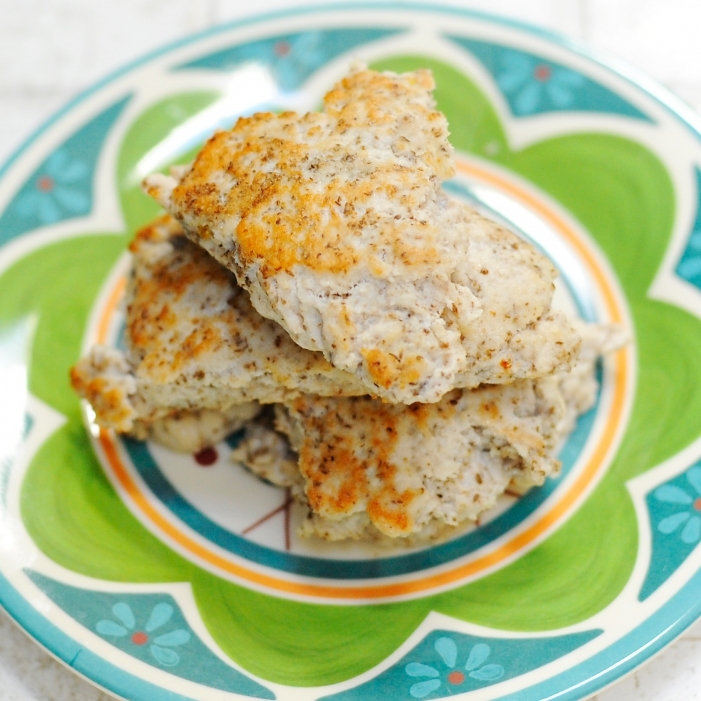 To make the turkey burgers, I use lean turkey meat, about 3 tbsp chia flour (I used Mila today, thanks Eleanor! ), 1/4 cup egg whites, plenty of celtic sea salt (about 1 tsp or a little more), some pepper, 1 tsp garlic and 1 tsp onion powder. Then, add about 1 tbsp of coconut oil to a pan, let it heat and add turkey. I use to make patties but now i’ll just pour the whole meat concoction in the pan and flatten it with my hand. Cook until 1 side is brown, then the other side, now turn on low and let cook until no longer pink in the middle. Another lunch, today for example, I had some chili and then roasted the Trader Joe’s Organic pre-cut broccoli. I added about 3 tbsp olive oil (and celtic sea salt) and it was yummy and crispy, and I ate it all! I’ll always keep around a bag of broccoli, some pre-cut sweet potatoes or brussel sprouts. And I still love the Brussel sprout lunch salad. Some of my snacks: I’ll have a turkey burger, some wild precooked salmon (Trader Joe’s) or some no nitrate turkey rolled with roasted seaweed (Trader Joe’s) and avocado , some carrots, a handful of raw (the salted ones can increase you appetite) nuts, soup, chili or whatever we have made around the house. If I am having a bad sweet tooth, for the Whole 30, I’ll stick to an apple (green have less sugar) or some berries. And by the way, the Whole 30 doesn’t exclude fruit. That is just something I am doing for now. Last thought on what you need to have around the house…the eggs, don’t forget the eggs. If you have nothing else, you always have this great protein ready to go. You can scramble some (yes, yolks too) with kerrygold butter, salt and pepper and have a great, quick meal. 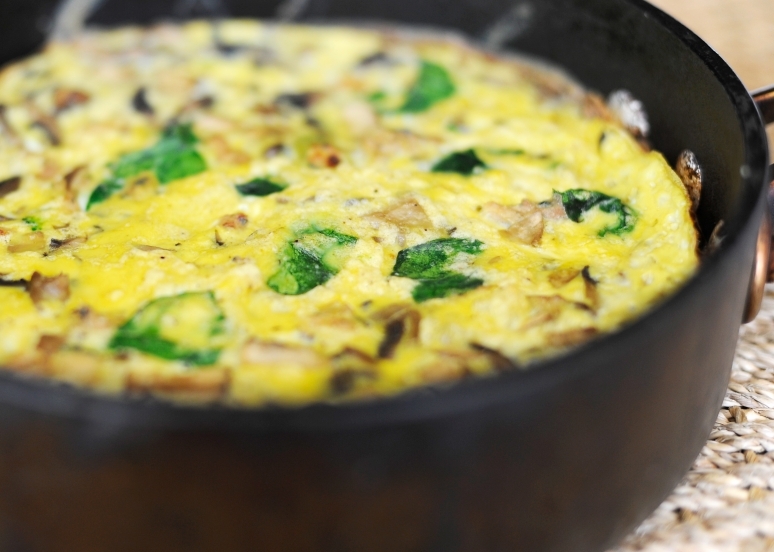 I also love frittatas and you can make them so many different ways. You can use any veggies you love like sweet potatoes, scallions, red or green peppers, tomatoes, red onion, some cheese (if you’re not doing the Whole 30), bacon, sausage. etc. Saute the mushrooms or whatever veggies you use in about 1 tbsp kerrygold butter. Add salt and set aside. Cook sausage (out of casing or chopped) or bacon in pan and set aside. Beat eggs in large bowl, add in veggies and meat. Pour in very well coated (I used coconut oil) oven safe pan. Cook on high on the stove and with a spatula, push aside the bottom of the mixture (like you would an omelette) to let the runny part cook for about 5 minutes. Move to preheated over and cook for 10-12 minutes or until done. Cut like a pizza and serve. Enjoy, good luck and Happy New Year! I would love to hear how everyone is doing!! Mary - What do your kids take for lunch and what about breakfast if they don’t like eggs??? 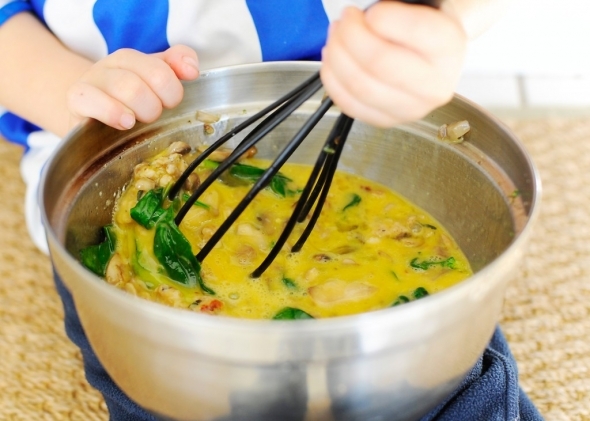 I have 3 boys 13,9, an 4 the 4 year old being the pickiest…… He hates eggs…. landriav - Hey Mary! Thanks so much for your post!! These two posts below hopefully helps to answer your question. I need to have it in a better place so it’s easier for people to find so thanks for the reminder.